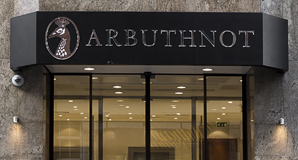 Exchanges: Arbuthnot Banking Group PLC ordinary shares are listed and traded on the AIM Market of the London Stock Exchange. Takeover Code: The Company is subject to the UK City Code on Takeovers and Mergers. Details of any restrictions on the transfer of securities:There are no restrictions on the transfer of securities. The Company currently holds in Treasury 390,274 ordinary shares with voting rights. AIM Market Shares not in public hands (Rule 26):Per the definition set out under AIM Rules for Companies, the total number of Arbuthnot Banking Group PLC ordinary shares of 1p each not held in public hands is 8,409,100 (57.59%).